Dan Fox (sliding) was sent off for Benington Reserves. 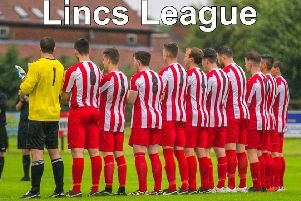 Swineshead Institute remain top of the Taylors Garages Premier Division after a convincing 5-0 home win against Coningsby, with Bert Snaith netting two of the goals. Chris Wing, Guy Mantle and Kieran Rose grabbed the other match-winners for Swineshead. Leverton got off to a flying start after only two minutes of their home clash with Boston College when Marc Hipwell thumped home Nathan Hubbert’s corner, before the same supplier set up Nathan Rippin to double the lead on five minutes. Rippin crashed home a shot to make it 3-0 after 23 minutes before the College finally grew into the game and made a match of it. The visitors started to pass the ball around and held firm for the rest of the half with home keeper Chase Maddison making a couple of excellent saves to keep the College attack at bay. College continued to push hard at the start of the second half but Leverton stood firm, with Joe Money, in particular, a pillar of strength. With the clock running down, Leverton’s Alex Lote-Greenfield jinked his way past two defenders before being scythed down and Rippin completed his hat-trick from the spot. The finishing power of striker Dan Reid proved pivotal in Skegness Town Reserves’ 4-1 home win against Old Leake. The visitors matched Skegness during the first half and they deservedly opened the scoring through Kane Watson after 40 minutes before Town levelled just before the break with a header. Skegness edged in front early in the second half but Leake could have equalised when Adam Abell looked certain to score, but Danny Kay pulled off a fine save. Skegness wrapped up victory with two close range efforts. Max Forman grabbed the other Town goal. Billinghay Athletic had a nightmare journey to Spilsby Town, conceding 13 goals in the process. Jordan Turner (five), Dan Cobb (two), Lee Boulton, Michael Twigge, Eddie Rich, JordanSmith, Ryan Summers and Travis Herberts were all on target for Spilsby in a completely one-sided affair. Billinghay’s consolation goal came from Liam Willows. A hat-trick from Liam Shinn helped Wyberton Reserves to a 3-1 home win over Benington in a cracking Premier Division contest at the Causeway. After a goalless first half, in which both sides squandered some decent chances, Shinn headed Wyberton in front shortly after the break. Substitute Gavin Bell brought Benington back on level terms only for Shinn to restore Wyberton’s lead minutes later. Some last-ditch Wyberton defending denied Benington a second equaliser before the hosts broke away in injury-time for Shinn to complete his treble. The match between Ruskington Rovers and Pointon was settled by a solitary Dom Kew goal. Kew’s killer goal earned Pointon maximum points following a 1-0 away win. Friskney had a fine 3-1 away win at Fishtoft with striker Victor Sibert on target twice for the visitors in the Taylors Peugeot Division One. Sibert showed his threat early on when he hit the post in the opening minutes of the game before he did find a breakthrough midway through the first period. Fishtoft pressed in second half but Friskney held firm and Sibert broke through once more to make it 2-0. Jed Stainton then headed in from a free kick to make it three before Fishtoft reduced the arrears with a Tom Ruck penalty 10 minutes from time. Fulbeck United entertained an improving Woodhall Spa United in the day’s big clash and it was the visitors who struck first through Nathan Wright to lead 1-0 at the interval. Fulbeck moved up a gear in the second half and two goals from Will Allen and another from Chris Bates saw them take three valuable points in a 3-1 home win. Fosdyke suffered a 5-0 home defeat at the hands of Horncastle Town Reserves although the game followed the usual pattern of Fosdyke playing well for a period of time then conceding a number of goals when seeming to forget how to defend. The first half saw Fosdyke camped in their own half against the wind and a talented Horncastle side who applied pressure right from the off. The defence stood firm for the first 20 minutes however until a bizarre moment should have resulted in Horncastle going in front when their keeper walloped a goal kick down field which bounced over his opposite number and, as Thomas-William Gilbert desperately clawed at the ball to scoop it away, the ball clearly had crossed the line by a good yard or two. As this was happening a Town striker piled in with a challenge and the ball ended up in the back of the net. In sheer frustration, Fosdyke’s keeper picked the ball up and whacked it away which was followed by the referee waving play-on. After that unbelievable let off, Horncastle did deservedly take the lead with a header from a corner and a second was added after a penalty was awarded and converted just before half time. Although having the wind advantage, Fosdyke were undone by two quick goals and this was followed by a late fifth adding insult to injury. Fosdyke did create the odd chance and Daniel Fletcher was unlucky to see his last kick of the game goal disallowed for offside, but that about summed up Fosdyke’s day. Railway Athletic found themselves without a game when opponents Freiston pulled out of their clash. Railway will receive the regulatory three point walk-over result. Taylors Ford Division Two leaders Sibsey suffered only their second defeat of the season when Coningsby Reserves snatched victory in a five-goal affair. Sean Taylor, Andy Chapman and new signing, Harry Wright were all on target in a fine 3-2 home win. Park United got off to the worst possible start when FC Hammers scored with their first real attack, and it took until the 25th minute for Park to draw level when Tom limb scored from 10 yards out. Park went ahead five minutes later through Alex Limb however, this was short lived, when a mistake by the Park keeper let Hammers into equalise. Park took control of the game in the second half but could not get the goal their football deserved including missing a penalty. However, 10 minutes from time Park finally got their reward when Alex Limb got his second of the game and then Declan Wilson sealed the victory with a close-range finish following excellent work by the lively Jimmy Harris. A Jack Hill goal was enough to give Wrangle all three points in their 1-0 away win at Billinghay Reserves. Holbeach Bank remain in contention at the top of the Taylors Vauxhall Division Three table following a 4-2 away win at Mareham United. Dave Wilson (two), Koycev Nayden and Valentin Calcan were all on target for the Bank while Chris Barnes scored both of the Mareham goals. Boston College Reserves went down to a narrow 2-1 home defeat at the hands of Northgate Olympic. Michael Fleming grabbed the College goal but it was all to no avail. In the other game, Fosdyke Reserves had a match to forget when they shipped in 17 goals at Boston Athletic without reply. There were two shocks in the BB Insure Willoughby Shield quarter-finals when two third division sides saw off the challenge of second division outfits. Although the victory of Division Three leaders Wyberton A, at second division strugglers, Kirton Town Reserves, was no great surprise, the actual 6-1 score-line probably was. Michael Reeson (two), Mckenzie Smyth (two), Jason Allen and Joe Medcalf were Wyberton’s scorers, while Town’s highlight came in the form of a wonder goal from ex-Wyberton player Darren Tate. The other shock took place at Benington Reserves where Fishtoft Reserves were the opponents in a quarter-final tie. In poor conditions, Fishtoft never really got going with Benington having most of the first half possession. Fishtoft’s cause wasn’t helped when their goalkeeper had to leave the field of the play after a nasty clash of heads with a Benington striker, and it wasn’t long until Benington finally opened the scoring with a shot from Tom Poole that was out of reach for the stand-in goalie to make the score 1-0 at half time. The second half started in an opposite fashion with Fishtoft having the majority of possession but to no avail as they couldn’t find a way past the Benington goalie who made a number of vital saves. With time running out tensions rose and the tackles started flying in and tempers flared up resulting in two red cards for the visitors within a 10 minute spell. Goals from Tom Ebberley, Cameron Cope and Reiss Wilson helped book Swineshead Reserves their place in the last four following a 3-1 home win against Old Doningtonians. Pointon Reserves squeezed through to the semi finals after a hard fought 2-1 home win against Leverton Reserves. Michael Rowlatt hit both of the Pointon goals.